Josh Brown|Miami Valley Today file Troy’s Nathan Kleptz hits a shot during last year’s sectional tournament. Josh Brown|Miami Valley Today file Troy’s Jackson Goodall returns for the Trojans this year. 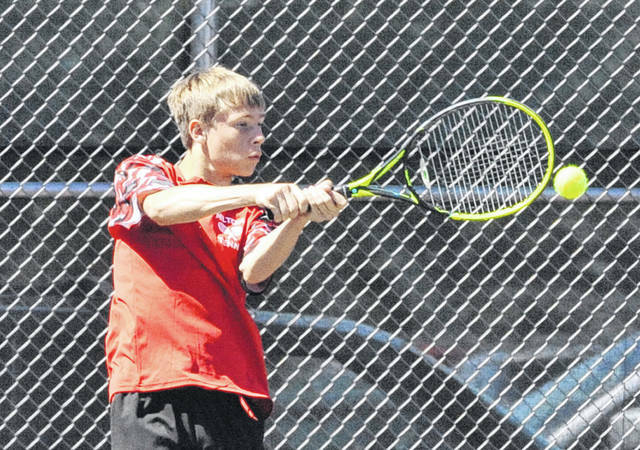 Josh Brown|Miami Valley Today file Nathan Brumbaugh returns for the Milton-Union tennis team this season. 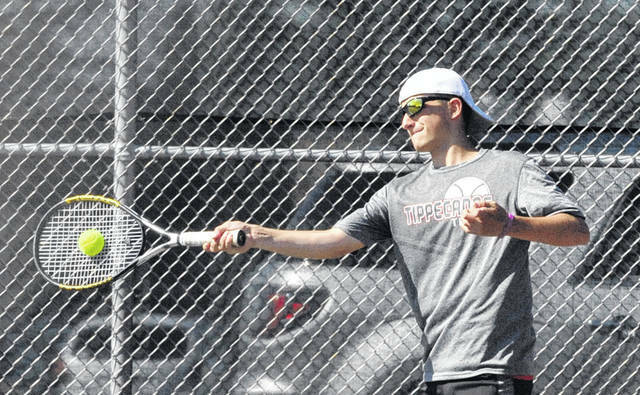 Josh Brown|Miami Valley Today file Colin Achterberg returns for the Tippecanoe tennis team this season. 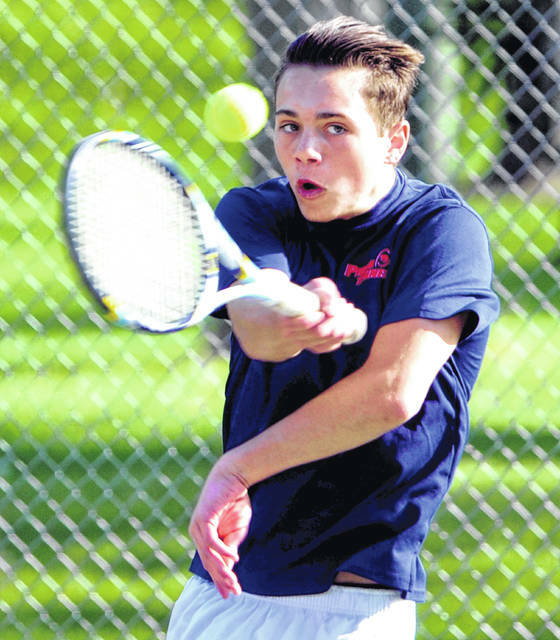 Mike Ullery|Miami Valley Today file Demi Nicholas returns for the Piqua boys tennis team. 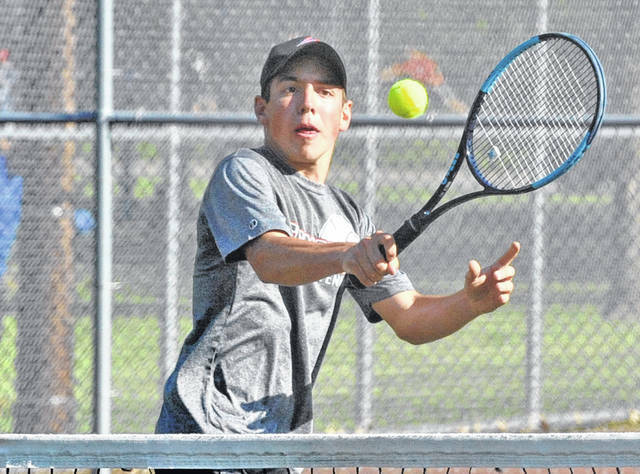 Rob Kiser|Miami Valley Today file Danny Lins returns for the Lehman tennis team this year. Josh Brown|Miami Valley Today file Tippecanoe’s Levi Berning returns this season. Josh Brown|Miami Valley Today file Milton-Union’s Nick Brumbaugh hits a return last season. Rob Kiser|Miami Valley Today file Elijah Jock hits a serve last season. He is back for Lehman boys tennis this season. TROY — The Troy tennis team enters the season on a three-year run atop the Greater Western Ohio Conference American North Division. As they begin their most recent title defense, though, the Trojans will have a completely new look. Troy graduated five seniors off of last year’s team, players that have been mainstays in the lineup their entire careers with the team. And with two returning players, no seniors and a horde of talented but inexperienced players, the Trojans are taking aim at a four-peat and closing out the team’s time in the GWOC with one final division championship. The Trojans graduated singles players Shane Essick, Elijah Sadler and Andrew Magoteaux, along with the second doubles team of Anoop Patel and John Wehrkamp. Essick was a four-time district qualifier, including a sectional champion in both singles and doubles. “Anytime you lose five seniors, it’s difficult,” Troy coach Mark Goldner said. “Shane was a district qualifier all four years, was the sectional doubles champion with Andrew last year, and before that he was the singles champ. We always knew Shane would be first singles, and second and third would always come down to Elijah and Andrew, with Elijah being second and Andrew third both their junior and senior seasons. And with John coming out last year adding some fire with Anoop at second doubles, it helped a lot. This year, competition for the top two spots is between the team’s only two returning players — juniors Nathan Kleptz and Jackson Goodall, who were the first doubles team last year. Beyond that, though, there are plenty of familiar faces for the team. Sophomores Noah George and Genki Masunaga were close to cracking the varsity lineup last season and will now get their chance. Junior Sean Dippold also got experience on JV last year, and a group of newcomers — junior Wyatt Hench, sophomore Matt Bess and freshmen Henry Johnston and Spencer Short — will also be competing for spots and time. “Noah and Genki were both very close last year as freshmen,” Goldner said. “In a normal year without a group like those five seniors, they would have been second doubles. They’ve played a lot over the summer and winter and have practiced a lot with the varsity. Same with Sean, we always had him at practice, so they all know what to expect. They’ve all played, they just need to gain the experience. Henry and Spencer, we’ve been pretty impressed with what they can do. They just haven’t been through it all yet. And Matt and Wyatt have been coming on lately, so we’re looking at them. And as everyone enters the final season of GWOC American North Division play, nothing is settled there, either. “Sidney’s going to be very good this year. They’ve got a couple singles players back and a freshman that will be tough,” Goldner said. “Greenville has a tough freshman at one, Tippecanoe should be better this year, Butler has its No. 1 back and should be better — we’re going to have to be ready to play. “Obviously, the goal is to win the GWOC North. And hopefully we can get some kids to districts, and we’re hoping to get someone through to state. With a pair of state qualifiers returning this season, Milton-Union is looking to continue its dominance in the Southwestern Buckeye League Buckeye Division. “We have our sights set on repeating for our eighth straight SWBL Buckeye Division title, along with winning the Schroeder Invitational this year,” said Milton-Union coach Roger Davidson, entering his eighth year at the helm. “We are also reaching for strong showing at the Coach’s Cup and CJ Doubles Tournament this year. Junior Nathan Brumbaugh and senior Nick Brumbaugh return at first and second singles, respectively, after qualifying for the state tournament in doubles last year. Also back will be junior Peyton Brown at third singles, where he spent much of last season. The first doubles team of senior Jake Swafford and sophomore Nathan Black also returns, as does junior Luke Barnes at second doubles, with a host of first-year players — seniors Caleb Wintrow, Will Morris and Isaiah Miller and freshmen Hunter Smith, Nik Brown and Joel Benkert — competing with third-year player senior Bradley Booker for the final spot. In its third — and final — year as a member of the Greater Western Ohio Conference, Tippecanoe is taking aim at a GWOC American North Division championship. Leading the way this season will be returning district qualifier Colin Achterberg, a senior captain who will be in his third year at first singles. The Devils will also lean on the first doubles team of senior Levi Berning and junior David Shininger, both returning varsity players from last year. Brian Gillespie takes over as Piqua boys tennis coach. The Indians finished 0-15 overall and 0-10 in GWOC American play last year. Graduating off that team was Sean Hatke. Returning letterwinners include sophomores Demi Nicholas and Stephen Dolder. Gillespie just wants to see the team make steady improvement throughout the season. Tim Ungericht returns for his fourth season as Lehman coach. The Cavaliers were 8-7 last year and ranked third in the Miami Valley Area in Division II and received votes in the final D-II state poll. Graduating off last year’s team were Griffin West, Sam Ritze and Ryan Goettemoeller. Junior Danny Lins is a returning district qualifier and will make the move to No. 1 singles. Freshman Sam Gilardi is the top newcomer and will play 2nd singles this year. Seniors Sean Toner and Cole Kramer are returning varsity lettermen and senior Elias Bezy, junior Elijah Jock and sophomore Max Schmiesing all return with varsity experience and will make up the rest of the lineup. “We have 13 kids out this spring, our biggest team since 2015,” Ungericht said. “We are young, but we expect to be competitive and have a winning season. We want to continue our tradition of district qualifiers. “Danny has worked really hard over the winter with lessons and match play, and I expect him to make the jump from first doubles to first singles successfully. Sam’s addition helps us depth-wise, and he is one to watch this year and in the future. The sky is the limit for him as he is very talented. Lehman does not compete in a league. Contact Troy Daily News Sports Editor Josh Brown at jbrown@aimmediamidwest.com, or follow @TroyDailySports on Twitter. Contact Piqua Daily Call Sports Editor Rob Kiser at rkiser@aimmediamidwest.com. https://www.dailycall.com/wp-content/uploads/sites/30/2019/03/web1_051218jb_troy_nathankleptz.jpgJosh Brown|Miami Valley Today file Troy’s Nathan Kleptz hits a shot during last year’s sectional tournament. https://www.dailycall.com/wp-content/uploads/sites/30/2019/03/web1_051218jb_troy_jacksongoodall.jpgJosh Brown|Miami Valley Today file Troy’s Jackson Goodall returns for the Trojans this year. 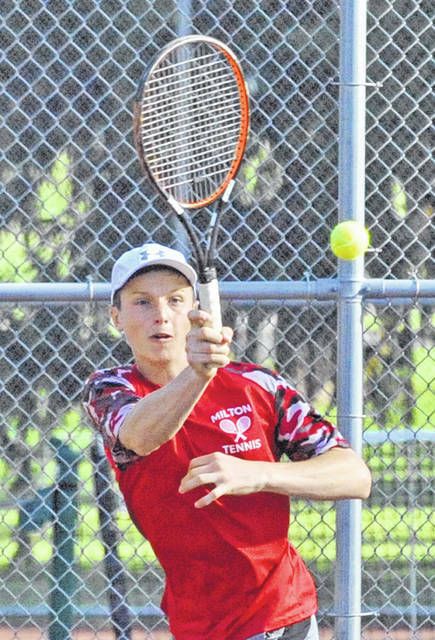 https://www.dailycall.com/wp-content/uploads/sites/30/2019/03/web1_051218jb_mu_nathanbrumbaugh.jpgJosh Brown|Miami Valley Today file Nathan Brumbaugh returns for the Milton-Union tennis team this season. 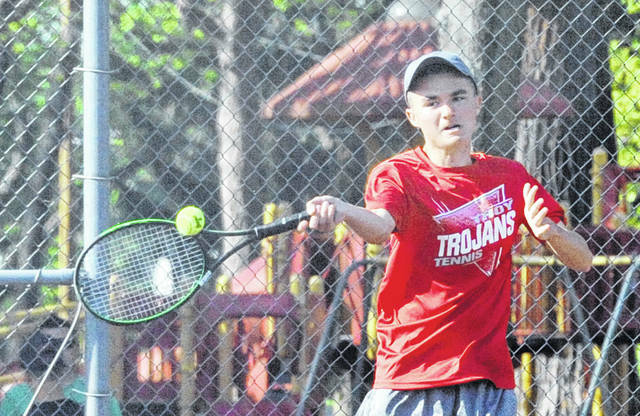 https://www.dailycall.com/wp-content/uploads/sites/30/2019/03/web1_051218jb_tipp_colinachterberg.jpgJosh Brown|Miami Valley Today file Colin Achterberg returns for the Tippecanoe tennis team this season. 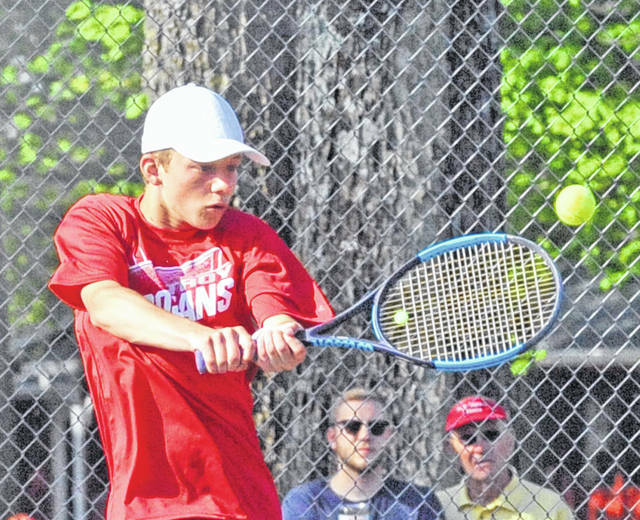 https://www.dailycall.com/wp-content/uploads/sites/30/2019/03/web1_nicholas.jpgMike Ullery|Miami Valley Today file Demi Nicholas returns for the Piqua boys tennis team. 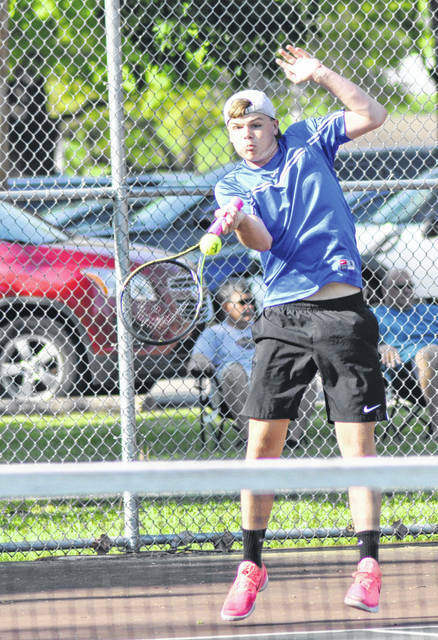 https://www.dailycall.com/wp-content/uploads/sites/30/2019/03/web1_danny.jpgRob Kiser|Miami Valley Today file Danny Lins returns for the Lehman tennis team this year. https://www.dailycall.com/wp-content/uploads/sites/30/2019/03/web1_050817jb_tipp_berning.jpgJosh Brown|Miami Valley Today file Tippecanoe’s Levi Berning returns this season. https://www.dailycall.com/wp-content/uploads/sites/30/2019/03/web1_050817jb_mu_nickbrumbaugh.jpgJosh Brown|Miami Valley Today file Milton-Union’s Nick Brumbaugh hits a return last season. https://www.dailycall.com/wp-content/uploads/sites/30/2019/03/web1_elijah.jpgRob Kiser|Miami Valley Today file Elijah Jock hits a serve last season. He is back for Lehman boys tennis this season.